Indian Mynas pose an extreme threat to Australian native birds and are rapidly invading the Goulburn Broken region. The Benalla Indian Myna Action Group is a sub-group of the Gecko CLaN. The group aims to raise awareness about the threat of Indian Mynas and to assist trappers to reduce local populations. Local Landcare groups within the Gecko CLaN own Indian Myna traps that are shared between members. Why is the Indian Myna such a problem? The World Conservation Union has included the Indian Myna in the list of the 100 most invasive species in the world and has described them as an extreme threat to Australia’s native wildlife. They adapt easily to human, urban and rural landscapes. Intelligent and aggressive, Mynas are now often the predominant bird in urban areas all along the east coast of Australia. During their breeding season, Mynas take over nesting hollows, harassing and evicting native birds and animals which use the hollows. They kill the chicks of other birds or destroy their eggs. Indian Mynas are noisy, aggressive and not afraid of humans. They can raise two broods of young every year, and spend their nights in communal roosts causing excessive noise and fouling. Indian Mynas can create fire risks in buildings as they make large, scrappy nests in roofs from sticks and any available rubbish they can find. Their nest building activities can also block rainwater drains and gutters, often causing internal water damage. Mynas are heavily infested with bird mites which can cause serious skin infections and irritations in humans. Dust from their faeces contains pathogens and viruses, which can cause serious lung infections, gastro etc. Due to their habit of living in close proximity to and interacting with people, mynas are likely to be a vector for spreading avian (bird) diseases which can potentially impact on human health. 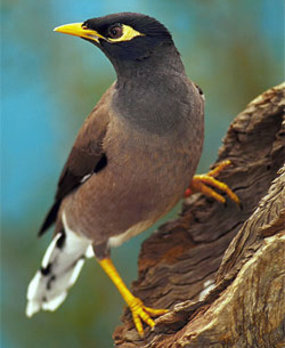 Indian Mynas occur naturally in southern Asia. They have been introduced into South Africa, North America, the Middle East, Australia and New Zealand. In the 1860s Indian Mynas were brought into Melbourne market gardens to control insects. They were then taken to Cairns and other places in far-north Queensland to control insects in cane fields. These attempts at biological control failed to control insect pests! Are chocolate browb colour with black head and neck. A yellow beak, eye patch, feet and legs. White wing patches which are obvious when the birds are flying. Don't feed them. Clear away food scraps when eating outdoors. Secure compost bins. Feed pets indoors, or clear away when they've finished. Block holes in roofs, or eaves to prevent nesting. Plant more shrubs to reduce open areas in gardens. On farms and rural properties, feed livestock and chickens only as much as they need, cover the feed bins and clean up any spills. Indian Mynas are an introduced species and so are not protected in Victoria or any other state in Australia. 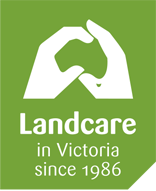 In Victoria, Indian Mynas are not listed as a pest bird under the Catchment and Land Protection Act 1994. There are no legislative requirements to control them. As they are feral birds, no permission is required to trap and dispose of them. However, obligations exist through relevant animal welfare legislation to treat and dispose of the birds humanely.